Hello friends! In light of our recent tire explosion and the financial hole we're digging out of (that someone seems to be chucking handfuls of dirt back into), school supply shopping lost some of its appeal. 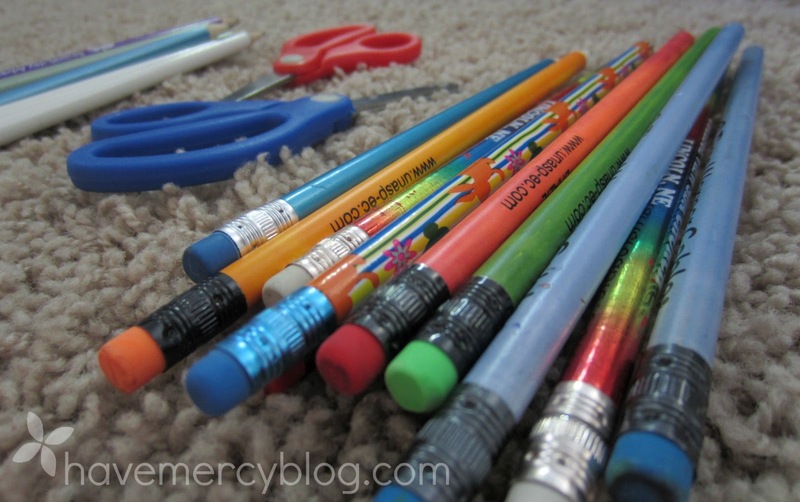 You may think I'm borrowing trouble by thinking about school supplies so early, but here in Nebraska, school starts the middle of August, which makes it just three weeks away! So...I thought I'd share how I followed my favorite tip from this article on saving in the back-to-school season. 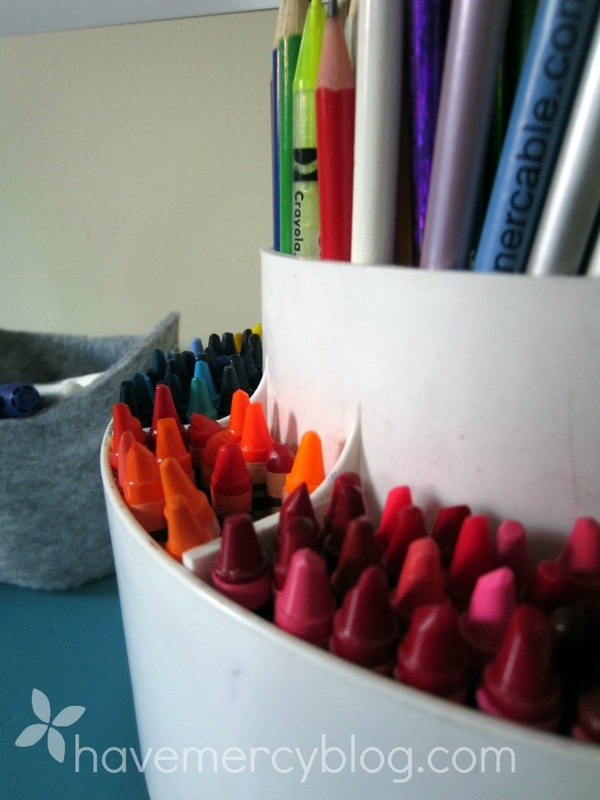 Kids have crayons long before they go to school, but it's easy to grab a new box. I knew I had a few small boxes of crayons we'd set aside to take on trips or refill this bad boy. 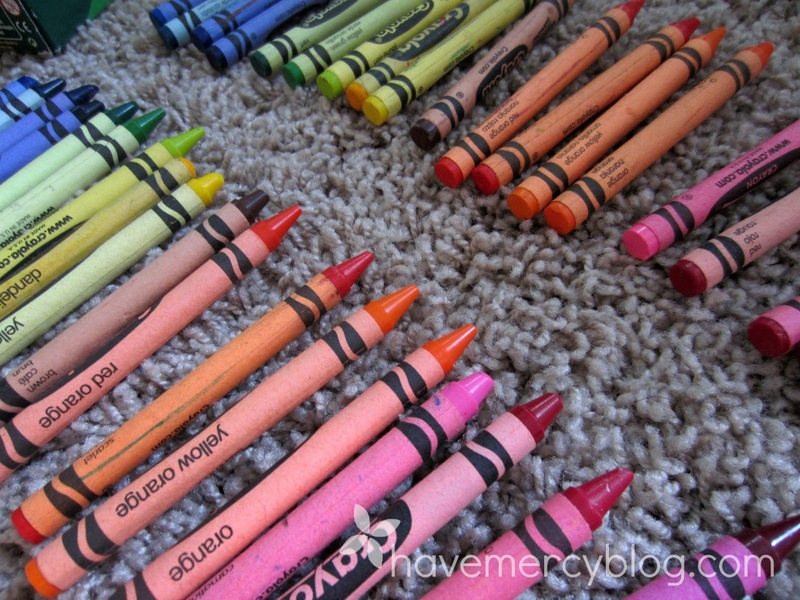 But when I went to get them, there were some colors missing and some were pretty used. I did like the idea of fresh crayons for school, rather than short, stubby ones you can't dig out of the box, so I got to sorting. I was able to find some pretty fresh ones in each color - twice! After the crayons were conquered, I designated two pairs of our household scissors for the kids to use. They were kid-size that I'd let them cut with at home. We have more of these because I went a little crazy once at the back-to-school clearance sale. I felt having scissors in each room would stop me from ripping tags off clothes and leaving little holes. It has stopped me, but I've also found, the pair I use most is in my dresser drawer and a couple were superfluous. I checked our Elmer's glue and found I had a little bottle that was half-full. I bought a bigger bottle at the store and filled the little one back up. Now they have one each. Our list requested 12 pencils, but didn't specify that they be number two. So I picked from our pencils - some more boy colored and some more girl, sharpened and bundled them for each. This is Chandler's bundle. So there's my two cents about back-to-school saving. One other thing that saved us was using Kohl's cash ($10 off a purchase) from when Brian bought running shoes. They don't carry school supplies per-say, but they did have a lunchbox Cadence liked. After the Kohl's cash it cost $2. Back up about twelve hours and see me staring at my Kohl's cash, heartbroken because I'd let my it expire by ONE day. Ahh! I decided it was worth a try and went the next. Taking the lunchbox to customer service, I asked if they'd still honor it. Thanks to my excellent foreshadowing, you know they did. And if you're a big ball of stress and don't have the energy for any of the above, go to one store, buy everything and pat yo self on the back. This parenting gig gets hard sometimes and any way you do it, you're a hero. Great back-to-school advice, Kendra. You are one smart shopper, or non-shopper, on a few of the items on the list. I work at a child development center and we take extra care not to ask the parents to purchase things that are unnecessary. I am always amazed how much the schools ask the parents to buy and many of the things are indulgent. I will definitely share this post with some of the parents at work. How very smart to use technology to help your kids have an easier time making a choice! Great idea! 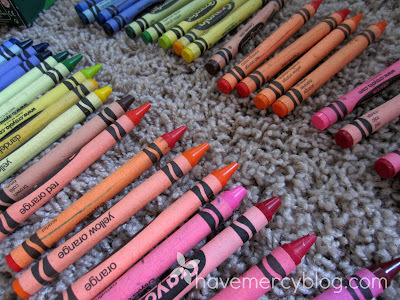 Also, I love your crayon photos...I would have wanted to start coloring as soon as I saw all the colors together!! I thought you did home school for your kids? Or do I have that mixed up?